« The Holiday Bloghop and Giveaway! To order a DVD, visit my Store page ! 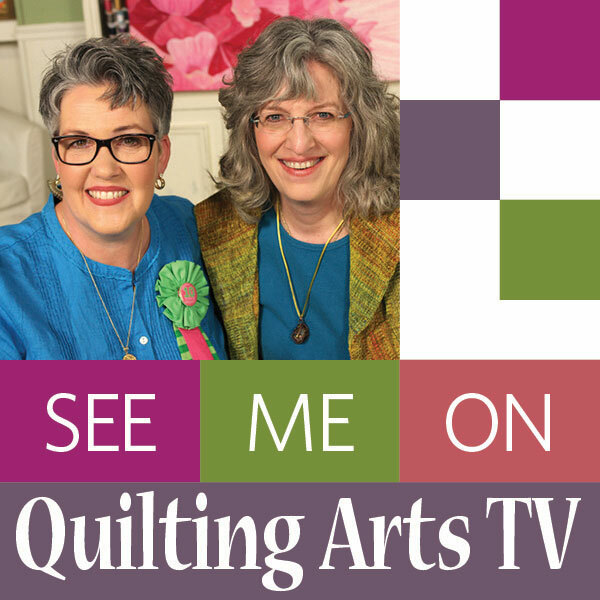 IN case you just can’t wait, you can order the DVD from me or, to order either the DVD or a digital download, visit Quilting Arts’ Interweave Store, here. And, of course, you can enter the various giveaways thanks to the generous quilt artists who are helping me give away copies. We’ll have two or three posts a week from now until the first of December. Just surf in here regularly to see who is reviewing and how (and where) to leave a comment for a chance to win this workshop. One of Marie’s colorful traditional (!) 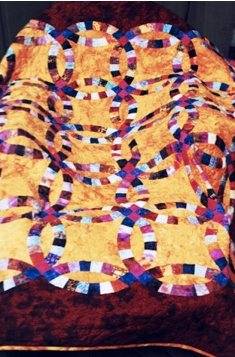 quilts–I remember when she made this! 11-13 afternoon: Quick alert: Marie lives on an island, and the underwater cable that has all the island’s internet on it has gone down AGAIN and they are tossed back into the dark ages (like the 1980s before cell phones and internet), so her post is delayed. I’ll update here when her post goes live, probably this weekend. The giveaway dates will expand accordingly! 11-15: Update! Marie’s post has gone live thanks to a brief return of her internet! It’s here. In case you haven’t already found Marie on the internet, I’d love to introduce you to a true Best Friend Forever: Marie Z. Johansen. Ya know how sometimes, maybe just a few times in your life, you meet someone and hit it off, and you know that no matter where life takes you, what happens to either of you, you will always be in touch, always be friends. If you end up, as we have, living on opposite sides of the nation, when you get together it’s as if not a day has passed. I’m privileged to call Marie my friend. 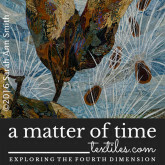 She’s also an amazing artist, crafter and person! 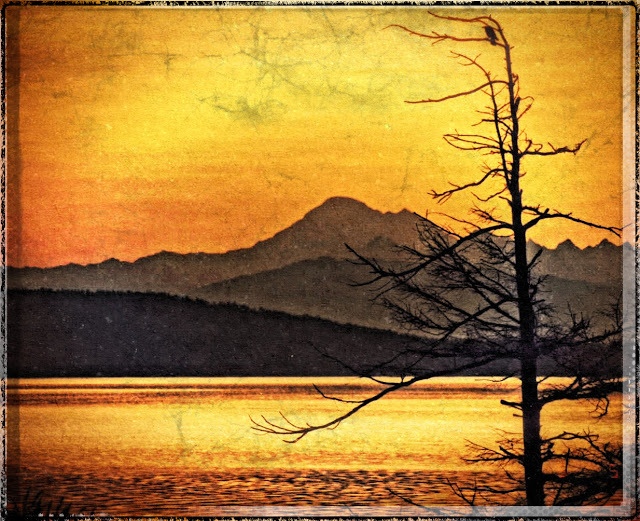 Marie’s digital imagery; the photo is of Mount Baker, and if I recognize that tree on the right, taken at the Anacortes Ferry Landing, probably while waiting for the ride home to the island. We met when I lived on San Juan Island, probably somewhere around 1999. Marie is someone who loves all sorts of art, from art quilts, traditional quilts, textiles of all sorts (she once worked at rug conservation), was a pilot, works in mixed media, loves animals and fountain pens, is a FABULOUS photographer, reads voraciously, blogs and journals, well…can you tell why we get along so well? (We travel together well, too! Here’s to Houston next year, Mrs. J!) And oh! She is allergic to some sorts of wool (the itchy kind! ), but I didn’t know that when I made her some felted wool slippers on year; guess what–they worked! That gift (I plead guilty) led to her obsession with knitting, and she has so far surpassed me there! Marie love tradition with a twist, as in this colorful Baltimore Album style bouquet. Right click to see larger. Marie blogs about books and writes reviews at Under the Willow Tree. She sells her jewelry on Etsy (those summer glow earrings are incredible! wish I could wear those colors!) 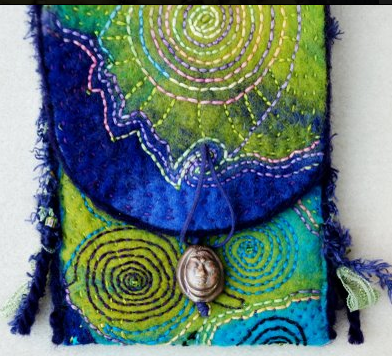 and her felted bags at Musing Crow Designs. For the felted bags, be sure to SCROLL DOWN, but cover your keyboard to protect it from the drool…. Marie Z Johansen’s felted bags, one of a kind, available to custom order here. As I’ve browsed Marie’s blogs and sales pages, I am reminded what a wonderfully interesting person she is–it comes across loud and clear in her blog. I think what I love about her blog is you NEVER know what’s going to turn up! She reviews books and products (from pens to quilt tools to whatever! ), muses about life, and is generally just someone you want to know! So please surf over to Marie’s blog to read about her review of my video workshop and find out how to enter the giveaway for a DVD copy of my workshop. PS: San Juan Island, Wash., where Marie lives, has had an incredible flash back to the 1980s, with long distance telephone, cell phones and internet out intermittently (and all day for a number of days) of the past 10 days due to a problem with an underwater cable to the island. If you can’t reach her blog on the first try or the post isn’t there, please be patient and pop back in later. She’s got the post ready, but may have connectivity issues that are out of her control. Murphy’s Law, eh? 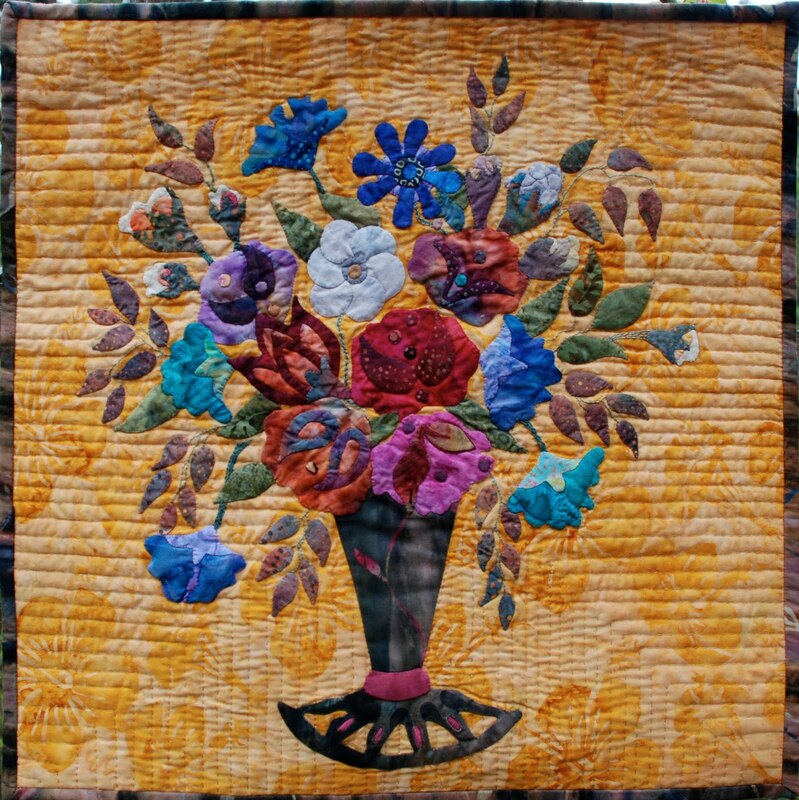 This entry was posted on Thursday, November 14th, 2013 at 9:05 am	and is filed under art quilting, Blogging, DVD. You can follow any responses to this entry through the RSS 2.0 feed. Both comments and pings are currently closed. Would love to learn how to play with thread. 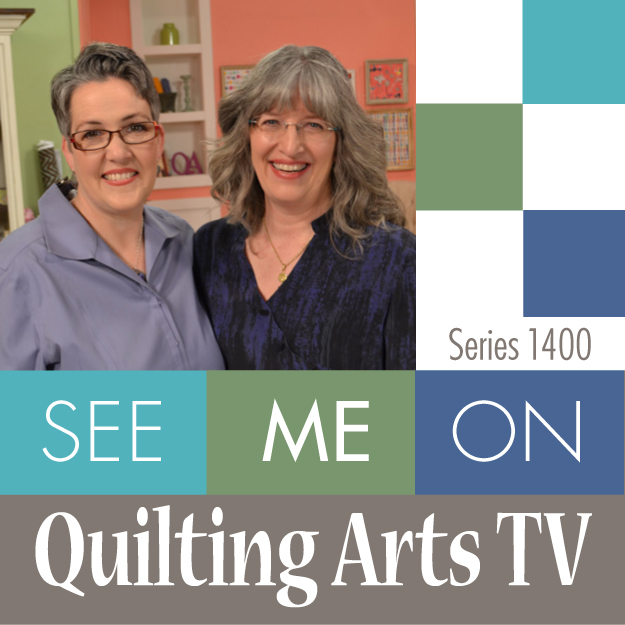 Congrats on the release of your Quilting Arts video!!! Would love to win this…..Brenda Smith says leave a code…..how about Diox Purple. I am just beginning with thread play and would love this.